Former Vice President Atiku Abubakar on Monday visited victims of the Mubi suicide attack receiving treatment at the Federal Medical Centre (FMC), Yola, where he donated N10 million to the hospital Paupers’ Fund. Abubakar told newsmen after he was conducted round the hospital wards to console the victims that he was satisfied with the hospital’s effort in the treatment of the patients as well as their response. The News men recalls that the twin bomb blasts occurred a week ago, killing scores of people and injuring many others. The first blast was said to have occurred at the mosque located in the market, killing all members of the congregation before the second one destroyed another part of the market. 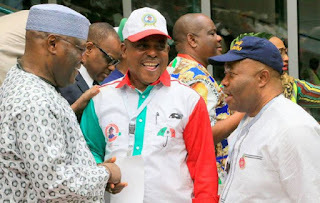 Atiku applauded the commitment of the management of the hospital and the committee it set up to manage the Paupers’ Fund meant for the treatment of underprivileged persons. “I once donated N10 million to the fund and decided to make another donation of N10 million today because I am quite satisfied with the way the fund is being managed. Abubakar underscored the need to recruit more security personnel, especially policemen, to boost internal security. “Happily, I have heard an announcement that more policemen are being recruited though not sufficient. Also speaking, the Chief Medical Director of the hospital, Prof. Muhammad Auwal, thanked the former vice president for his support to the hospital. “He is the major financier of our Paupers’ Fund and I want to put it on record that the fund, since inception, had financed the treatment of about 300 patients, including those with major surgeries. “The management of the hospital has no access to the fund and there is no exchange of money at all; we give the service and the fund pays directly into our TSA,” Auwal said.